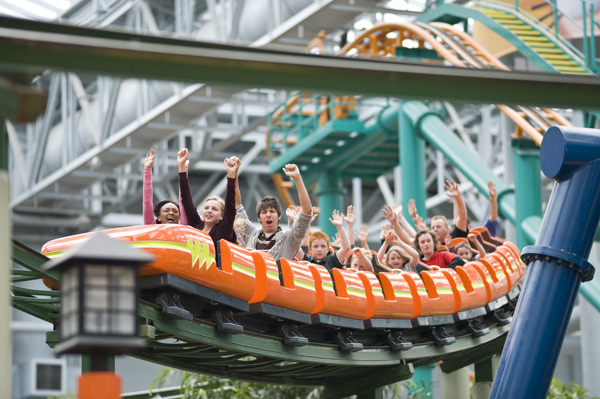 Living just 6 miles from the big mall, and being a roller coaster fan, it is only natural to play hooky from work once in a while and go ride the coasters at Nickelodeon Universe in the Mall Of America. Here are my reviews and ratings of each of the five roller coasters at the mall. 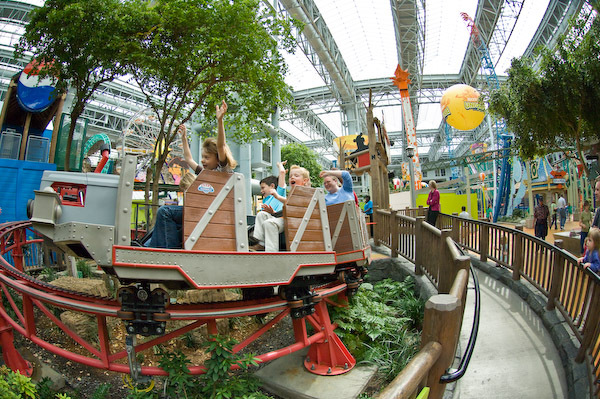 Note that Nickelodeon Universe has free parking and no admission fee. The NU roller coasters are paid for by presenting a ride card. Ride cards are purchased at kiosks in the park, which accept cash or credit cards. The card has points, with each ride being between 3 and 6 points. Points typically cost $1 each, however, you can buy day and year passes, evening passes, or take advantage of a special discount on Tuesdays that saves 50%. When the mall opened in 1992, the theme park was called Camp Snoopy. It featured the Peanuts cartoon characters and rides based on themes from the long running cartoon strip. After Charles Schultz passed away, the company that owns the Peanuts characters has dramatically increased the cost to license the Peanuts cast and logos. The Mall was not able to pay those kinds of fees, so the Peanuts gang left the mall in January, 2006. It operated as The Park At The Mall Of America, and it featured characters from the Yogi Bear show. In January, 2008, the mall signed a 10 year agreement with Nickelodeon TV to operate the theme park under a SpongeBob SquarePants theme called Nickelodeon Universe. As part of the rebranding, several new rides were installed, including three excellent steel roller coasters to augment the original Ripsaw roller coaster. The NU theme park held its grand opening on March 15, 2008. Note—these photos are from a NU press kit. I did not use my own photos on this page given that kids ride on these rides, and I didn't want to post photos of other people's children on the web. The Ripsaw Roller Coaster, later known as the Pepsi Ripsaw, was the premier ride at Camp Snoopy until the opening of the Timberland Twister in 2004. It is now called the Pepsi Orange Streak under the Nickelodeon branding. The Orange Streak is somewhat unique in that it is fully indoors. Since it is in a shopping center, noise is a major concern. As a result, the Orange Streak was built with steel track and nylon wheels to keep the noise at a minimum. This did result in some compromises in the ride. For example, the indoor coaster at Galaxyland in the West Edmonton Mall offers a much more aggressive ride, but it is far more noisy. The Orange Streak starts from an elevated platform that sits just in front of where home plate was once located at the old Met Stadium. The Orange Streak goes up a 40 foot hill, making a sharp turn at the west end of the building. From there, it makes two fast turns, then runs to the other end of the building doing a few bumps along the way. It then slows down to a crawl as it wanders around and behind the log flume. The coaster emerges from the flume area, makes another tight turn, and heads for home. This is somewhat disappointing for a coaster fan. With the huge indoor space and 2,680 feet of track, they could have built a really nice roller coaster. But instead, the Orange Streak spends much of its time in flat areas going very slow, and only about 1/3 of the ride is any fun. To be honest, there isn't much appeal here other than to small kids. Anyone who has ridden any of the modern outdoor steel coasters will be bored by the Orange Streak. This may sound amazing to anyone who recalls the hype when the Orange Streak first opened. At the time, people were fainting and passing out just watching the Orange Streak, and it had to be stopped to rescue panic-stricken riders on several occasions. Some folks must not get out much. The Orange Streak uses lap bar restraints, and they are designed for smaller people. Anyone who is normal size or larger will have a hard time fitting in. On the plus side, the ride is very smooth. But that isn't hard to do when you have a maximum height of 40 feet and a high speed of 30 miles per hour. Still, this is a unique coaster, so everyone should try it once. If nothing else, it offers a great tour of the theme park. The ride lasts 2-1/2 minutes and costs $5.00. My rating = 2 screams. The Timberland Twister was a new addition to Camp Snoopy in 2004. It is now called the Fairly Odd Coaster with the SpongeBob rebranding. The Fairly Odd Coaster statistics are 1,345 feet of track, 54 foot high start, maximum speed of 31 miles per hour, and a 60 second ride. One might suspect another tame ride given these relatively modest number. But, did I tell you that each car spins as it runs along the track? Oh, that changes everything. What might have been run of the mill becomes run for your life. This is one of the first spinning roller coasters, and the only one that is indoors. It is well worth seeking out. The Fairly Odd Coaster runs 3 cars, one at a time. Two can be active while the third car is being loaded. Each car runs by itself with up to 4 passengers. There is both a lap restraint and a seat belt, and both are needed to survive this thing. The lap restraint pivots in such a manner as to be friendly to large and tall people. Once a car leaves the starting gate and climbs the hill, it is released to pivot and spin around at will. This twisting motion gives a whole new dimension to the ride, and makes the ride different each and every time you tempt your fate on this beast. The Fairly Odd Coaster starts by climbing a 54 foot tall hill. At the top, the car enters a series of flat tight curves. These serve to get the car spinning. You then hit a set of speed retarders, and enter a series of helix turns. You are really moving in these turns, and really spinning, and at the same time, you are not really sure why you did this to yourself. Next, after another set of speed retarders, you enter a series of big up and down hills. You then hit yet another set of speed retarders, and then enter a series of fast sharp bumps. The 2nd bump has a very steep drop, and it feels like you are going to fly up and out of the car. Just as you land back in your seat, the car starts up the next bump, which has the effect of doubling the G force and really plasters you down into your seat. Finally, you take one last tight sideways turn, and head for home. The Fairly Odd Coaster is nearly a perfect ride. It is long enough to be worth standing in line for. It is very smooth. It is also pretty aggressive, so you get a fairly good rush. It is also different every time you ride, so it doesn't get stale. The only downside is the speed retarders. There are at least 3 sets of them, and they are very annoying. Maybe they will relax them a bit as they gain experience in running the Fairly Odd Coaster. Ride cost is $6.00. My rating = 7 screams. The Rock Bottom Plunge is a modern steel roller coaster designed by Gerstlauer Euro-Fighter. The trademark feature of a Euro-Fighter is the beyond vertical drop. As this was written in early 2011, if you want to ride the best indoor roller coaster in the world, this would be it. 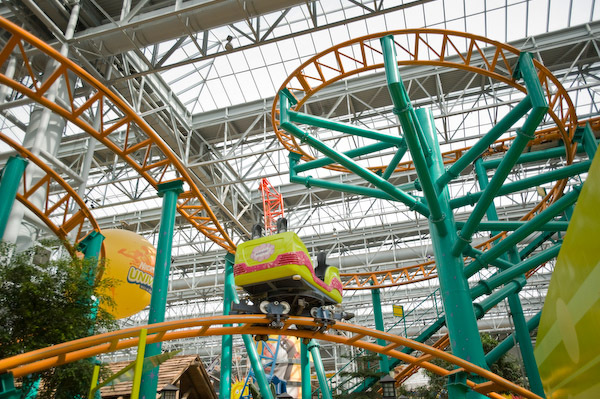 The Plunge, or SpongeBob as some coaster fans call it, is located in the northwest corner of Nickelodeon Universe at the site formerly occupied by the Mystery Mine motion simulator ride. The coaster runs one car at a time, with each car seating 8 people in two rows of 4. A single car makes much better use of the available space because it allows for tighter turns than what could be negotiated by a train of roller coaster cars. The ride begins with a skyward climb to the top of the vertical plunge. Since the track climbs straight up, you ride upwards laying on your back looking through the skylights in the roof of the theme park. Many folks take this opportunity to review their life, while others chat with their neighboring riders about their last will and testament. Since the ride sits 10 feet above the floor, the track rises 67 feet, and the car is about 4 feet tall, you finally make the turn at the top of the plunge at some 85 feet above the ground. The roller coaster car pauses for a few seconds at the top of the vertical plunge, and then all hell breaks loose as you tip over the edge. Not only do you head straight down, but the track goes past vertical until it is at a 97 degree angle. You don't just fall down the 67 foot vertical drop, the weight of the coaster car slams you down to the bottom of the plunge. If that wasn't enough, as soon as you hit the bottom of the plunge, you immediately head into a 40 mile per hour 30 foot diameter inside loop, ending up completely upside down. While 40 miles per hour is tame for an outdoor roller coaster, in this tight of a loop, your stomach ends up going through your seat and sits on the floor of the car. That is, assuming your stomach ever caught up with you after dropping down the plunge. After the loop, you hit a small bump in the track the gives you a real good negative G bounce. The bump is so well placed that it ends up being one of the highlights of the ride. From here, you enter a vertical loop at the far end of the coaster. This loop sends you back to the west end of the ride, but does so by twisting you sideways, then fully upside before untwisting you back to level. Once you get level, you head up into a corkscrew style barrel roll that again takes you upside down. Finally, the first half of the ride ends with a tight banked turn that ends with a speed retarder. Once you hit the retarder, the ride is essentially over. Not that there isn't track left to cover, but rather, at this point, riders are mostly mentally numb from the intensity of the rapid fire sequence of effects that got us to this point. Exiting the retarder, there is a lazy turn to the right, a small drop, a 180 degree loop laid over at a 30 degree angle that again puts you on your side, a bit of track leading to a tight helix turn, and then a bit more track leading to the end of the ride. It is amazing that the Rock Bottom Plunge can fit 1,345 feet of track into such a small corner of a shopping center. But they did, and Eurofighter made the most of that space. I exited the ride fully mentally numb leaving me in my happy place for the rest of the evening. It was the best 48 seconds of my roller coaster fan life. As far as indoor coasters go, this is, by far, the machine to beat. Ride cost = $6.00. My rating = 9 screams. 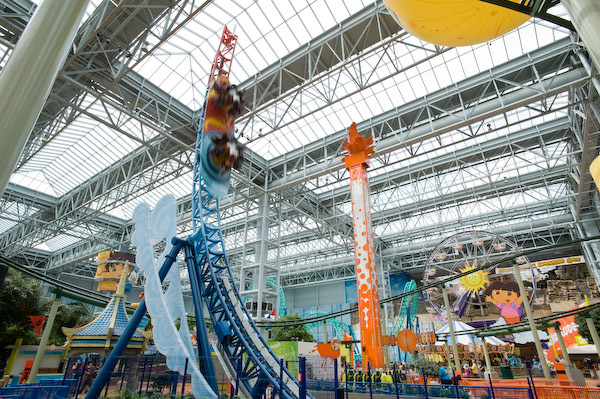 The Avatar Airbender opened on March 15, 2008, as part of the grand opening for the rebranded Nickelodeon Universe theme park. It is the first shuttle coaster to be built indoors. A shuttle coaster is a segment of track where the car goes back and forth rather than making a loop. The Avatar is a half-pipe style shuttle, which means that the track forms a large U-shape. 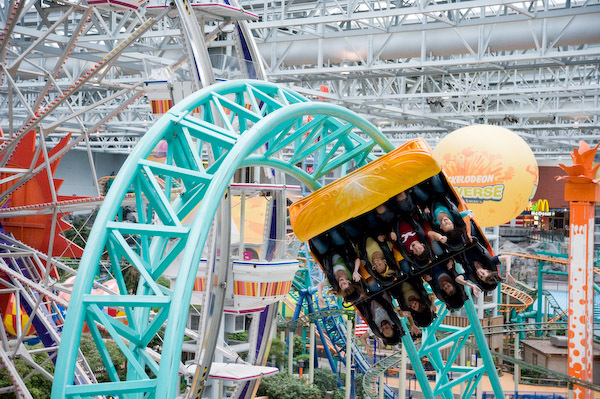 The Airbender is located in the center of the Nickelodeon Universe theme park. The base of the track sits in a small depressed area in the floor. There are two clusters of seats that site on a single car that is built to resemble a large skate board. When the ride begins to operate, the floor on both sides of the car drops out of the way to allow the car to move. The track reaches 70 feet up into the massive steel beams holding up the roof of the mall, ending just below the glass skylights. The car makes 14 passes on a typical ride. It takes 4 passes to for it to build up speed to reach the top of the track, it makes 6 full passes where it hits the top at both ends of the track, and then 4 more passes to wind down and come to a stop. The car will reach speeds of up to 30 miles per hour. The ride lasts about 60 seconds and costs $6.00. The real trick to the Airbender is that the two seat clusters spin. The seats are molded so that you sit down in the seat, and then the overhead restraint comes down to lock you in. A safety strap holds the restraint in place. When the shuttle car moves, the seat clusters spin at a relatively rapid rate, flinging you outwards against the seat restraint. This makes for a really fun ride. It was also the biggest anxious point of the ride. I wasn't able to avoid thinking about physics and centripetal forces along with my nearly 300-lb weight conspiring to try to kill me. It makes you wonder just how sturdy those levers and straps are. Then again, that is a somewhat absurd thought because no one has ever been hurt on the Airbender, and all roller coasters have some tiny non-zero element of risk. Perhaps that is what makes the Airbender so successful...it pushed me to the far side of the thrill zone without putting me into any real danger. And if you don't know much about physics or mechanical engineering, you will find this ride to be a complete blast. My rating = 8 screams. The Back At The Barnyard Hayride is designed for kids who are too small to ride on the Pepsi Orange Streak Roller Coaster. Small kids can ride with an adult, while kids over 3-1/2 feet tall can ride by themselves. An adult would have little interest in this ride unless they were entertaining one or more kids. The Hayride, formerly known as the Lil' Shaver back in the Camp Snoopy days, runs for about a minute and a half over a 150 foot loop of track at speeds of up to 10 miles per hour with a maximum drop of 8 feet. It is $3.00 per ride. My rating = 1/2 scream. Mall Of America, Official Web Page. CoasterGallery, Joel Roger's Excellent Roller Coaster Photography Site.